Everyone loves a good “boy meets girl” story and everyone also loves a good renovation story. Well, put the two together (and throw in some Flow Wall products) and you’ve got Robert and Kym’s story. Kym Johnson-Herjavec is an Australian professional ballroom dancer who both competed and judged the Australian Dancing with the Stars as well as competed on America’s Dancing with the Stars. She has also appeared on Australian Celebrity Survivor: Vanuatu and The Celebrity Apprentice Australia (Season 3). As a certified fitness professional, she wrote the book The 5678 Diet: The 14-Day Plan for Healthy, Lasting Weight Loss and recently created the 5678 platform – a Cardio-latin Dance Series and Nutritional Guide. Robert and Kym met when they were matched up as dance partners for Dancing with the Star’s 20th season. They finished together in 6th place but that did not prove to be the end of their partnership. They married on July 31, 2016, in Los Angeles. Last year, after more than 40 years in Los Angeles, the enthusiastic fitness guru Richard Simmons’ Slimmons Exercise Studio closed its doors. Richard said goodbye to his fans and followers in a Facebook post which received 12,000 reactions, 1,500 comments, and 861 shares. But with this ending came an exciting new beginning for the studio. When Kym heard about the closing, she drove straight there in order to purchase it on the spot. While desiring to keep the special energy that has been shared in the space since 1974, she is now in the middle of an exciting remodel to turn the place into her own fitness, dance, and nutrition studio. Kym wanted to create a more modern aesthetic in her new studio while maintaining the friendly integrity of Richard’s original studio. This is where award-winning Celebrity Interior Designer and Design Psychology Expert and RST Brands Outdoor Living Brand Ambassador Kelli Ellis comes in. A competitive ballroom dancer herself, she and Kym have a lot in common and it was easy for them to see eye-to-eye on the studio’s redesign. Kym and Kelli found the perfect Flow Wall products to integrate into the design. With them, they were able to achieve a clean, organized space that is extra functional due to the customizable nature of these products. For the small office space, they went with two sets of 26” upper wall cabinets in white. Each of these units includes an adjustable shelf. The hardware is sturdy since it is all steel. For the lower shelves, they chose the same cabinets but in the graphite carbon fiber color. They also intentionally left the doors off so that they could have open storage that works perfectly for displaying Kym’s books and other decor items. These cabinets are mounted on the wall with the 24 sq. ft. Panel Pack in white. This allows the cabinets to “float” and free up floor space. For the merchandise area, they used the same Slatwall Panel Organizer (but in the large 48 sq. ft. size) and hooks in order to accommodate clothing and other branded items. 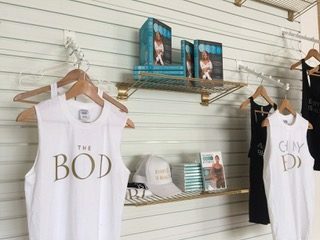 Thanks to the Flow Wall system, Kym and Kelli will be able to customize the studio to match their branding and desired style aesthetic. With these two areas complete, the rest of the studio remodel can be completed and Kym will be able to open her exciting new business soon.